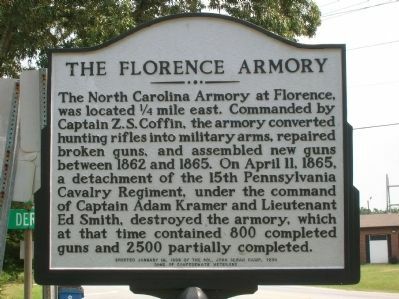 The North Carolina Armory at Florence, was located 1/4 east. Commanded by Captain Z.S. Coffin, the armory converted hunting rifles into military arms, repaired broken guns, and assembled new guns between 1862 and 1865. On April 11, 1865, a detachment of the 15th Pennsylvania Cavalry Regiment, under the command of Captain Adam Kramer and Lieutenant Ed Smith, destroyed the armory, which at that time contained 800 completed guns and 2500 partially completed. Erected 1989 by Col. John Sloan Camp, 1290 Sons of Confederate Veterans. Location. 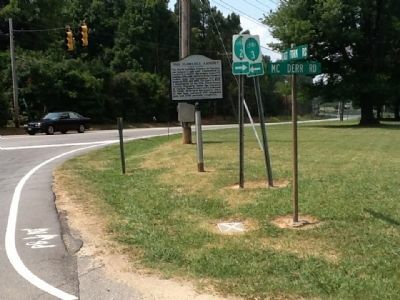 36° 1.254′ N, 79° 57.458′ W. Marker is in Jamestown, North Carolina, in Guilford County. Marker is at the intersection of Fork Road and Penny Road, on the right on Fork Road. Touch for map. Marker is in this post office area: Jamestown NC 27282, United States of America. Touch for directions. crow flies. Deep River Friends Meeting (approx. 0.8 miles away); James Mendenhall House and Mill (approx. 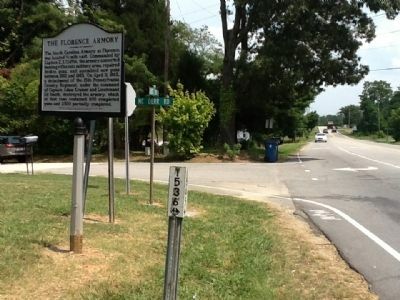 1½ miles away); Confederate Arms Factory (approx. 1.7 miles away); Jamestown Friends Meeting House and Cemetery (approx. 1.9 miles away); William Reece House (approx. 2 miles away); Richard Mendenhall Store (approx. 2 miles away); Home of Richard Mendenhall (approx. 2 miles away); Lord Cornwallis (approx. 2 miles away). Touch for a list and map of all markers in Jamestown. More. Search the internet for The Florence Armory. Credits. This page was last revised on June 16, 2016. This page originally submitted on July 21, 2012, by Michael C. Wilcox of Winston-Salem, North Carolina. This page has been viewed 471 times since then and 9 times this year. Photos: 1, 2, 3. submitted on July 21, 2012, by Michael C. Wilcox of Winston-Salem, North Carolina. • Craig Swain was the editor who published this page.